So we have been talking about using oils to help water act as a moisturiser. The final part of this q&a is precisely that question, which oil is the best? The honest answer is.........who knows? However, since I can just leave it there, I did some extra research and found that mixing several oils may be beneficial. Read on! In experiments, scientists can use artificial sebum (sebum is the naturally occuring oil found on the hair) International Journal of Pharmaceutics , pg 37-43, 2009.. Artificial sebum mimics natural sebum and involves combining several different types of oil and oil related compounds. 1. Squalene (around 15%) - If you google it please check out the safety information from WHO, it is naturally occuring and safe. So I know the list doesn't include favourites like castor oil or shea butter. It certainly doesn't mean they are not effective, it just means that science is lagging behind. They are both known to be rich in fatty acids which give them one hit on the list above. I think science could deal with exploring these oils more especially because of their consistency. I think of it like HD TV which is advertised as 'better than real life'. The point of mixing the oils to get artificial sebum is to get one which flows like human sebum but I wonder, could you get a better form which perhaps doesn't flow as much and is therefore present and effective for longer? 2. Shea butter melts (Recently discovered by me.......or maybe not but I'm claiming it! 50% shea butter and 50% coconut oil...solid at around 20-23 degrees, melts gorgeously in your palm.). Any other mixes out there that you want to share?! A little goes a long way. I make a batch every 3 or 4 months. Actually, you bring up a really good point, sebum is present on hair and skin. I think if you like it on your skin, it may do quite well on your hair too. I love that you use aloe vera gel from the actual plant, a million organic stars to you! JC, I love, love, love aloe. It stems from having a grand(mother) that kept aloe plants in her house. We still drink it daily. I have lots of aloe plants in my back yard but could never get beyond the bitter taste to drink it :( how do u do your drink mix MrsLilRaven? JC.. always wondered whats the deal with jojoba. I have read in many places that its very similar to sebum but i have never seen a comparison of the chemical constituents to prove this...what's your view? I used to mix only oil and that worked fine for me too. I also used jojoba oil to seal my ends after washing my hair. It worked alright but I had better results with a mix of sheabutter and jojoba oil. Most of the coconut oil in my country do not harden either. Is it as efficient ? As I understand it, sebum is only produced from the skin/scalp. African hair receives much less than other hair types which is why our hair is dry unless moisture is replaced. Also what little is there has a hard time traveling down to the hair ends on coily hair. 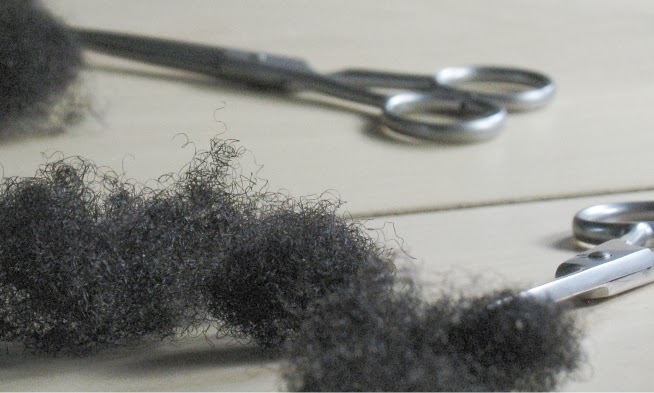 Many non-African ancestored people can tend to have the opposite problem....they can have an over-production of sebum from the scalp which causes excessive oily hair and clogged follicles. Our follicles can get clogged too, but definitely not from an over-production of sebum!! Many of the products we use can clog the pores which further decreases the secretion of sebum. Clogged hair follicles can even lead to further issues such as hair loss. Beside jojoba, Apparently Shea Butter wont clog either. A nightly scalp massage can also stimulate the flow of sebum. I'm gonna have to try that 50% Shea Butter to 50% Coconut Oil!! That sounds divine!! I use a 50/50 mix of Shea and EVCO, add a half-dropper of neem oil a spoon of castor oil and a few drops each of Rosemary, tea tree, lavender, basil and clary sage essential oils. My coworkers say my hair smells like an herb garden...very nice! I love olicoco oil! I use it to pree poo and add it to my dc mixes. I use shealoe as well.